The Philadelphia Style Course is the newest Meet Up workshop created by our founder Karima Renee to help women better address the challenges of shopping retail and identifying personal style. Each course (event) will have a lesson plan specific to tackling the general fashion needs, questions and concerns of most women. The workshops in the course will cover topics like the secrets of thrifting, online shopping, personal style identification, and shopping and more. So, who should take a course in the workshop, everyone! These classes are perfect for those who need, style renovation, innovation or motivation. Courses are facilitated by us the curvy girls of Skinny Minority. 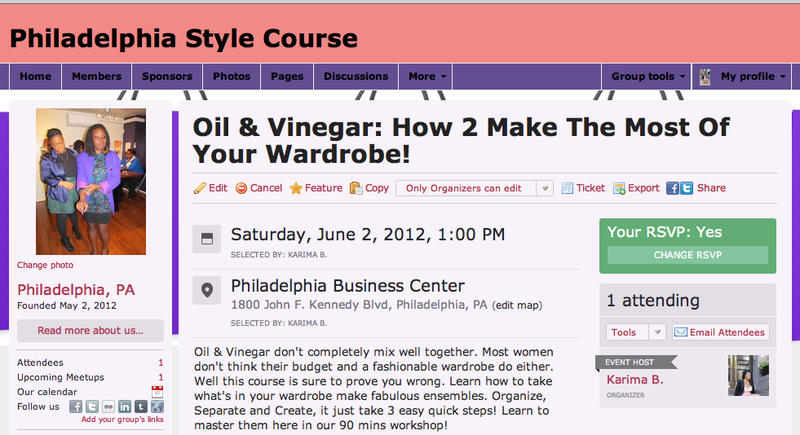 So are you ready to sign up for our first course…Check out Workshop 1: Oil & Vinegar below! What: Oil & Vinegar don’t completely mix well together. Most women don’t think their budget and a fashionable wardrobe do either. Well this course is sure to prove you wrong. Learn how to take what’s in your wardrobe and make fabulous ensembles. Organize, Separate and Create, it just take 3 easy quick steps! Learn to master them here in our 90 mins workshop!